The consoles come with a miniature second analog stick situated on top of the face buttons, which now sport the old school SNES controller colors. Nintendo has also added two new shoulder buttons and updated the system with a more powerful CPU, which should help to speed things up on the e-Shop among other things. There is also built-in NFC support for the company’s upcoming amiibo hybrid action figures, customizable hardware faceplates/themes (seen above), and a replaceable battery that offers seven hours of gameplay. Both the new 3DS and 3DS XL have swapped the SD Card slot out for a microSD and feature better viewing angles, according to Nintendo. Also during the Nintendo Direct event today, the company announced that it was releasing a port of Xenoblade Chronicles that will only run on the new 3DS hardware. While this may sound like the start of an unfortunate trend for current gen 3DS and 2DS owners, there are no details as to whether or not the company will continue making exclusive titles for the new system, and it’s likely just something to bolster support at launch. 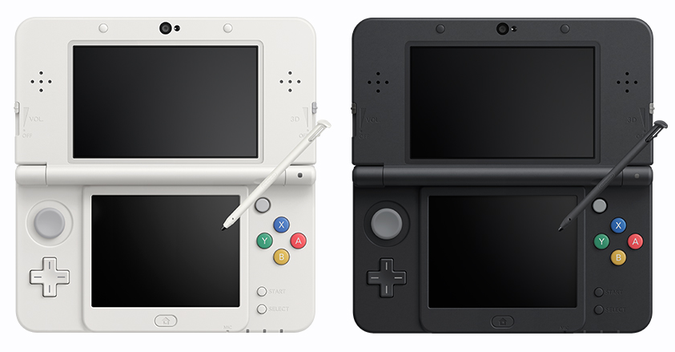 Unfortunately North American gamers will have to wait until next year before the next generation 3DS comes available. It is expected to release in Japan on October 11th starting at 16,000 yen (about $154). In the mean time, keep an eye on our daily game round ups for the best deals across all platforms.